Social Democracy for the 21st Century: A Realist Alternative to the Modern Left: Pro-EU Leftists are now: The TINA of the Left!! This much should be very clear if you have bothered to engage them at length, as was clear to me in a recent debate on Twitter. 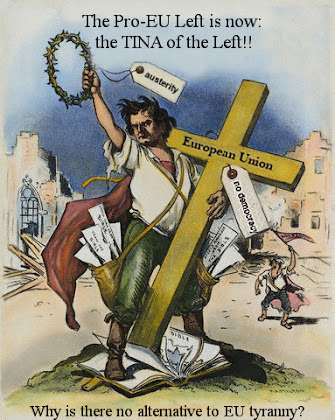 The Pro-EU left is now the TINA of the Left! Why can’t European states return to national political and economic sovereignty with reformed parties of the left?